On February 7, 2019, Frank Roberts, a director emeritus on MBARI’s board of directors, passed away at the age of 99. A prominent lawyer in the San Francisco Bay Area, he was also a close friend of and personal attorney for MBARI’s founder, David Packard. Roberts was a founding member of MBARI’s board of directors starting in 1987 and also served on the board of MBARI’s partner institution, the Monterey Bay Aquarium. His legal expertise was highly valued in board meetings for both institutions. 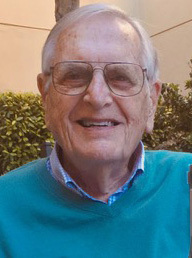 In a reflection of Roberts’ long-time connection to MBARI, Roberts’ heirs have graciously requested that any memorial donations in his name be sent to either DePauw University or the Monterey Bay Aquarium Research Institute.